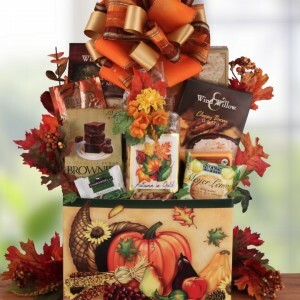 Thanksgiving Gift Baskets: Send Your Hostess Gift Ahead of Time! If you’re among the many people who will be trekking across many miles to spend Thanksgiving with your family, you’re keenly aware of how stressful many elements of this journey can be. There’s time away from work to schedule, clothing to pack, plane or train tickets or gas to purchase, and pets to prepare for the trip or prepare for a sitter. And that doesn’t even touch on the time involved in getting from Point A to Point B when it seems everyone else in the country is taking the exact same route you are! It’s no wonder most of us end up picking out little presents in the airport or shops along the way instead of shopping ahead of time. The trouble with these last-minute gifts is that it’s usually not too tricky to determine that last-minute is exactly what they are. As we’re already struggling with luggage and a small amount of space, we’re restricted to tiny items we can easily fit in our bag. In addition to this, there is a limited selection and limited time – a dangerous combination that can lead to pocket-sized flashlights, key chains and gum! We have a better idea that is not only a much more desirable gift, but also saves you from the added frustration during an already impossibly busy time – Thanksgiving gift baskets.